In Orlando, something very different is going down. Castle Church Brewing Community is in the final stages of planning. It’s a brewery, of course. But it will also be a fully-functional and ordained Lutheran Church, with regular church functions. I recently spoke to Aaron Schmalzle, brewmaster and co-owner of Castle Church, about research, donations, and 95 other things. I actually came of drinking age living as an expat overseas and had some really premium quality beers. But I first discovered American craft beer back in undergrad while in Ohio. My very first craft beer sixpack was a mix of Bell’s Two Hearted Ale, Bell’s Oberon, and Great Lakes Brewing Company’s Dortmunder Gold. Those were a far cry from the “Natty Light” most of us college students were drinking back then. I started brewing on stove tops when I lived in Milwaukee, where there’s a rich history of breweries, brewery tours, and home brewing. I started homebrewing after sharing a beer with the owner of Lakefront Brewery. My wife graciously gave me the green light to convert our garage into a 1/2 barrel pilot brewery. How did you start crafting a brewery and church? Jared and I were aware of our national church (Evangelical Lutheran Church in America) supporting “pub church” ministries, which are basically churches that meet once a month or so at a local bar to sing hymns and maybe share in the Eucharist. We wanted to take that concept one step further by having the church start up a working brewery/taproom, which would allow us to be sustainable and to use the proceeds from the brewery for outreach and “making a difference” in our community and world. How has the reaction to your concept been? So far, we have been very humbled by the positive response to the brewery/church concept. The Castle Church faith community will have regular times for worship, Bible studies, and discipleship groups in the brewery, and church events will be mixed in with brewery events. We’re really trying to create and focus on being a “third place” where people can meet up with friends and family to be a part of a community outside of work and home. 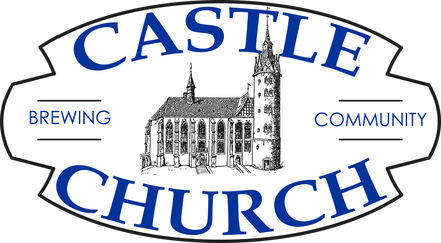 Some people will choose just to engage with Castle Church as a brewery, and that’s fine! Others will want to get involved with the life cycle of the church for Word and Sacrament worship and opportunities to live our their faith daily. Everyone is welcome and we value the diversity of authentic community. Castle Church is a place where people can connect with others, grow in lives of discipleship, or just stop in for a beer. “Castle Church” is the common nickname for the place that was the beginning and center of the Protestant Reformation. We could think of no better name for our brewery that was planning to do “church” in a new and different way. “Brewing Community” is a play on words; we are a community that brews beer, but also our goal is to brew a healthy and vibrant community. People say they like how Castle Church Brewing Community sounds, even though it’s not a typical name. We’re not your typical brewery, and definitely not your typical church, either. Our signature beer is All Saints Einbecker Ale. It is the product of almost a decade of research and trial and error! This style of beer was Martin Luther’s favorite beer but it went extinct in the 1600’s after a war destroyed all the breweries. Being a “church nerd” and brewer who was curious as to what this beer would have tasted like, I started researching all I could get on the style. Fortunately, Luther made mention in several of his books about the look and taste. There was also an historian from the 1700s who looked at beer from that region that was also curious about the formerly famous beer that had been shipped all the way to Jerusalem (more or less unheard of back then). Brewing back then was also the equivalent of what we call farm-to-table today, so it became a matter of looking at what ingredients were available to brewers in that region/time period. All Saints Einbecker is a 6.7% ABV what has 1/3 wheat, 2/3 pale malt with a light hops note and a very slight tangy aftertaste that dissipates almost immediately. It is a clear golden amber color with a hint of light fruit esters from the mix of yeasts we use. Despite many of the individual components being acquired tastes for many beer drinkers, everyone who tries this brew has liked it. It also ages very well and we’re looking forward to a barrel/cask version in near the future. When we decided to go pro, we needed to find a building that could support a 20bbl brewery, provide the space to create a relaxed and authentic “third place,” and a location that would maximize our exposure. We’re now in negotiations on a property near the new Orlando City Soccer Club stadium, the new UCF/Valencia campus, and the Amway Center. Some of the beer recipes we brew are the result of not being able to find certain styles, or thinking we could do a particular style better than a beer we try. Sometimes you taste a beer and say, “It’s good, but I wish it had slightly more malt,” or “I’m sure that could have been done better!” As we became more serious about opening a brewery, we wanted to have a broad spectrum of flavors and styles so that at least one or two of our beers would appeal to everyone who came to the brewery. A lot of brewers have departed entirely from the Reinheitsgebot (German Beer Purity Law of 1516), but I think there’s a greater challenge and reward for crafting a perfect beer from only four ingredients (water, barley, hops, and yeast) so most of our beer recipes are a unique take on a traditional style. We do craft some seasonal beers from ingredients that we can find locally. For instance, I go to church with a blueberry farmer from Bartow and every year around the time he harvests, we brew a Blueberry Saision which is a real crowd pleaser. We are also the only brewery to do 100% Wheat Porter, which is usually a pleasant surprise for first time tasters. The names for our beers attempt to offer a little vignette of our faith journey. For example, All Saints Einbecker was Martin Luther’s favorite style beer, and All Saints’ Church in Germany is the site where he famously posted the Ninety-Five Theses on 31 October 1517, the act that has been called the start of the Protestant Reformation. Sometimes we get really creative with the naming, as in the case of Indulgences Double IPA. Part of Luther’s 95 Theses criticized the church for selling of indulgences, which back then were a corrupt way of making money by selling pardons for past or future sins. Our Double IPA was so delicious it seemed sinful, and it actually weighed in at 95 IBUs, so Indulgences seemed like a fitting name. All of our beers have a story or meaning of some sort, and we list many of them on the website’s “Our Beer” section. The craft beer industry is generally a very supportive and community-centric group. We’ve all been at those beginning stages at one point or another, and have all been helped by someone further along in the journey. My advice would be to work on their beer recipes and get good at reproducibility. One of the best ways to see if you’re ready to go from hobby to pro is if you can consistently craft the same beer every time you brew it. I’d also recommend talking to a brewery owner and/or brewmaster to see what goes into starting and operating a brewery. It’s not easy, and definitely not always glamorous, but can be very rewarding. But to be successful, you need to know what you’re getting into. It’s not likely…If you look at a city like Portland, which has similar demographics to but has a more developed craft beer culture than Orlando. There are currently 84 breweries operating in Portland’s greater metro area! The demographic and lifestyle trends of Orlando’s growing population indicate that it is on the cusp of a craft beer renaissance comparable to what similar cities have gone through over the last 10 to 20 years. How can people help you get started? Because our brewery is a socially conscious business, solely-owned by the church, all net profits and extra proceeds go to service partners and external organizations that make a difference in both our local and global community. Instead of shareholders or equity partners, our startup has been completely funded by the generous and committed support of our church leadership, ministry partners, supporters who want to see a new brewery in Orlando, and those who are curious or “get” the vision for doing church differently. We are only $283,000 away from meeting our $1,400,000 development goal. We have had a lot of positive feedback about our pledge program which is paired to some amazing Castle Church perks as a Thank You for helping us reach our goal. You can take a look at donating to Castle Church Brewing Community at https://www.castlechurchbrewing.com/development.